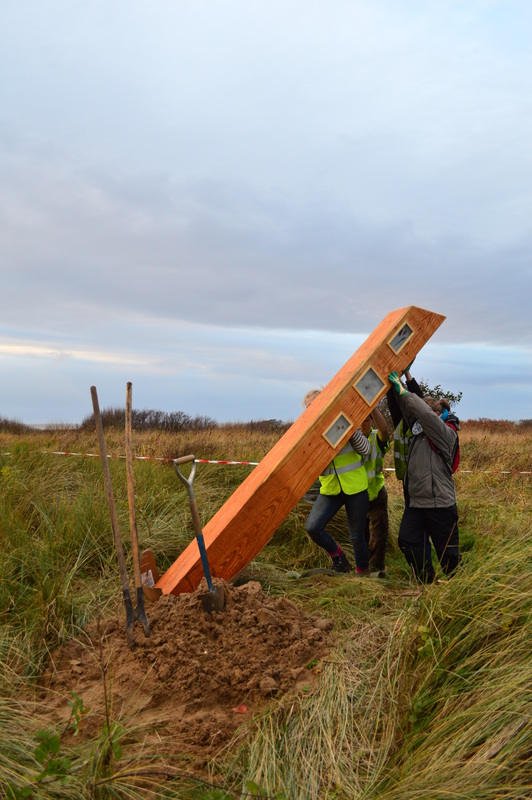 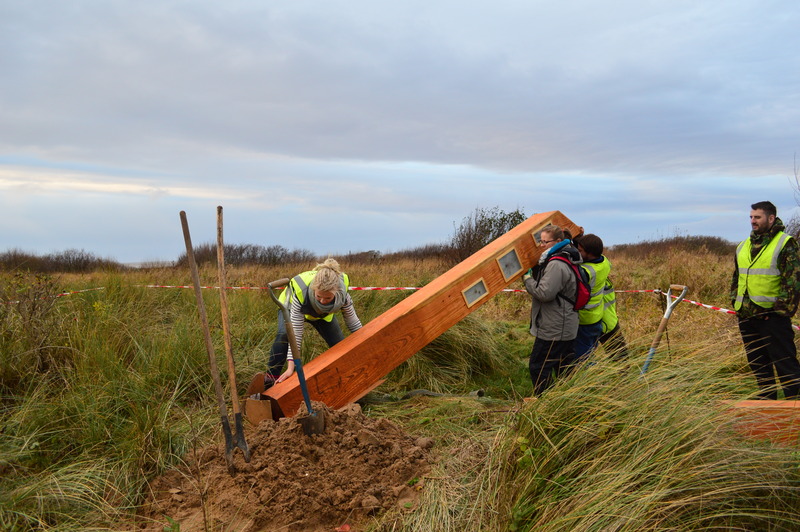 The final sculpture on the Sefton Coastal Path Sculpture Trail was installed at Hightown just before Christmas. 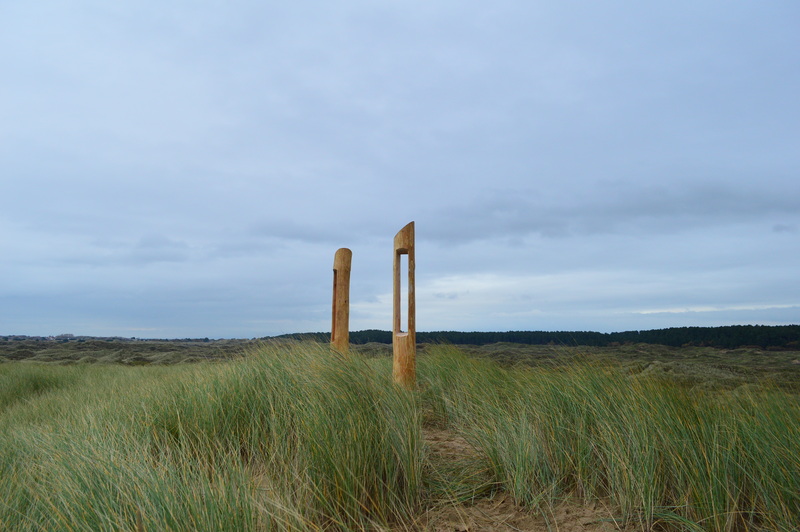 This sculpture forms a trackway that runs along the new cycle path leading from Hightown to Crosby beach. 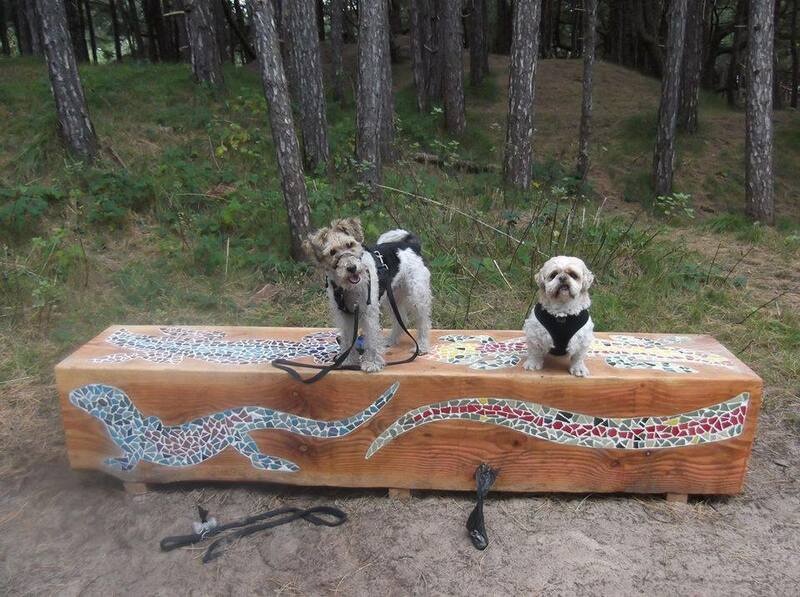 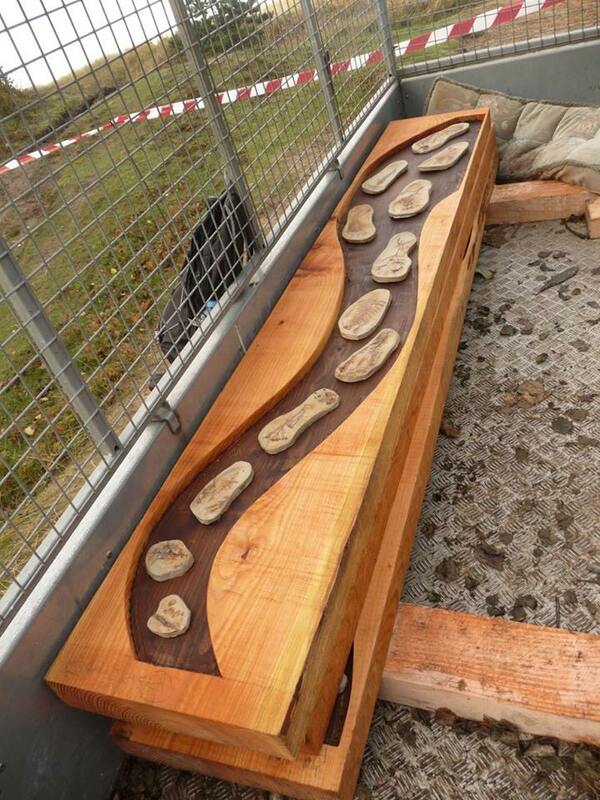 Over 20 feet of wood has been installed which contain artwork relating to the ancient man-made trackway that has been discovered in the area. 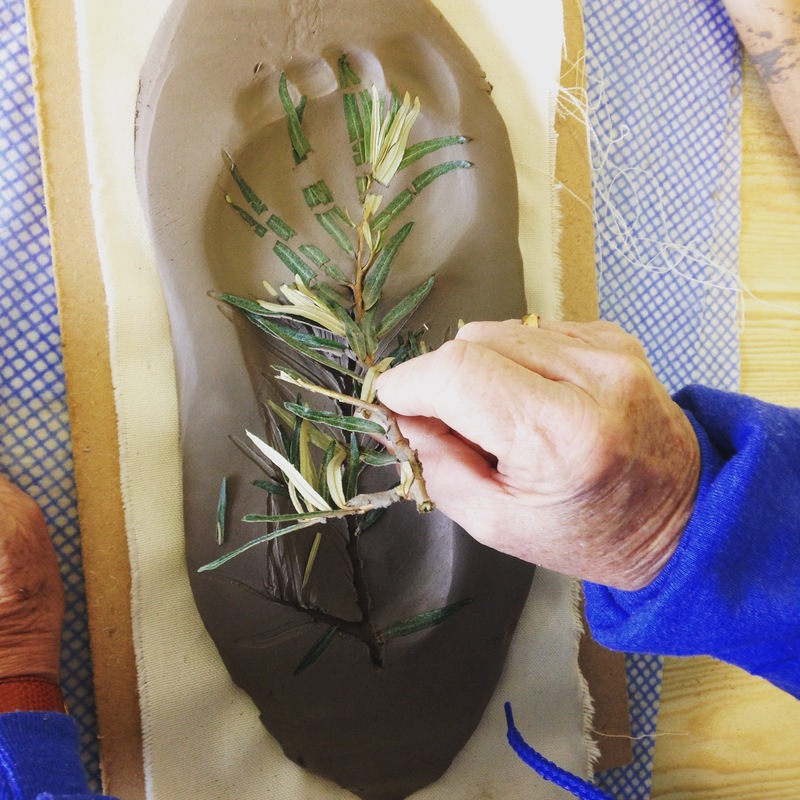 For the artwork we visited Cambridge Children’s Centre and Brunswick Youth Club and delivered workshops based on metal embossing. 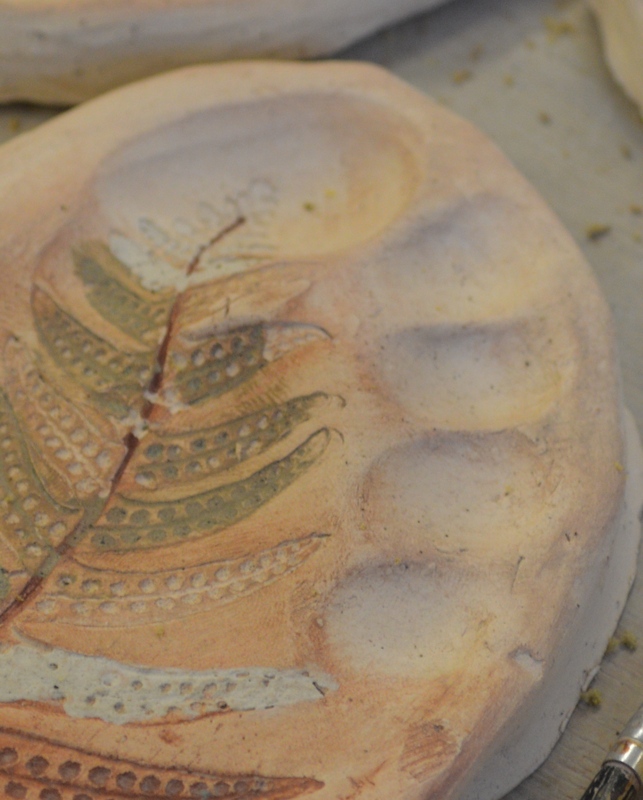 The images are all of food that our ancestors would have eaten in the area. 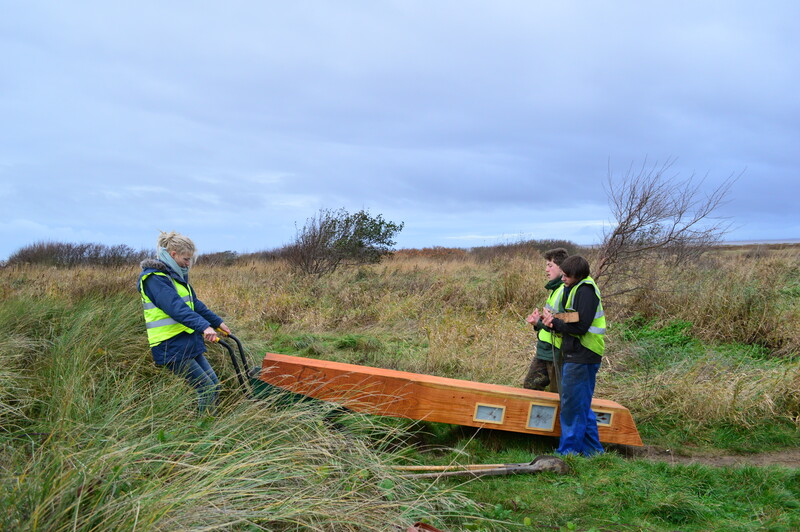 before lying them down and securing them in place. 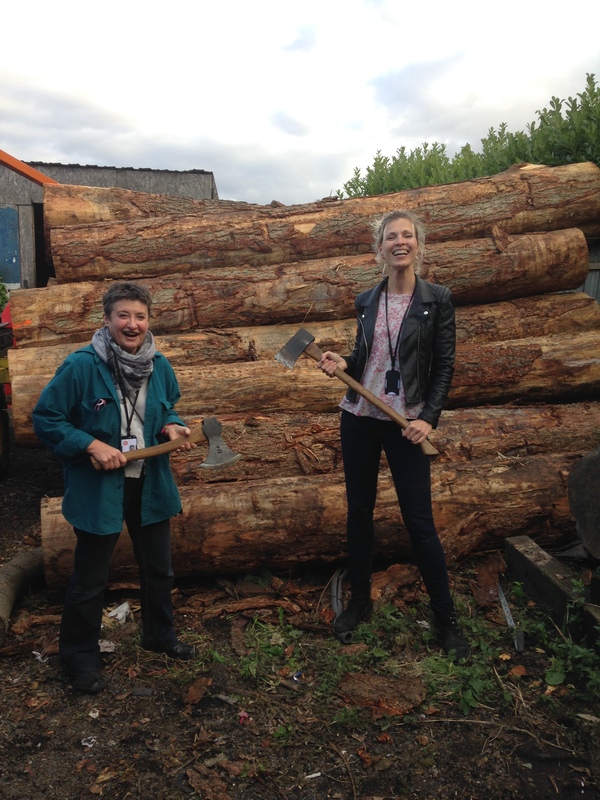 Huge thanks to Fiona, John and Rachel, to all at the Cambridge Children’s Centre and the super kids and staff at the Brunny. 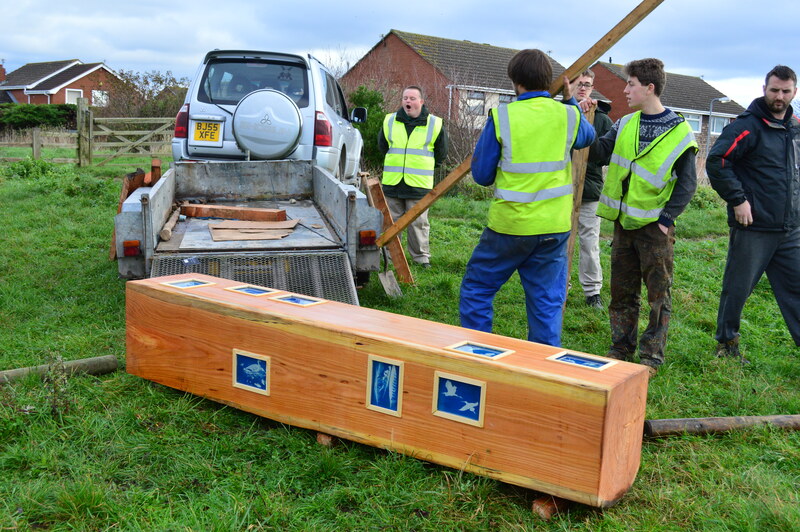 And as always to Phill and Joe – Adam, you were missed – such a super installation team. 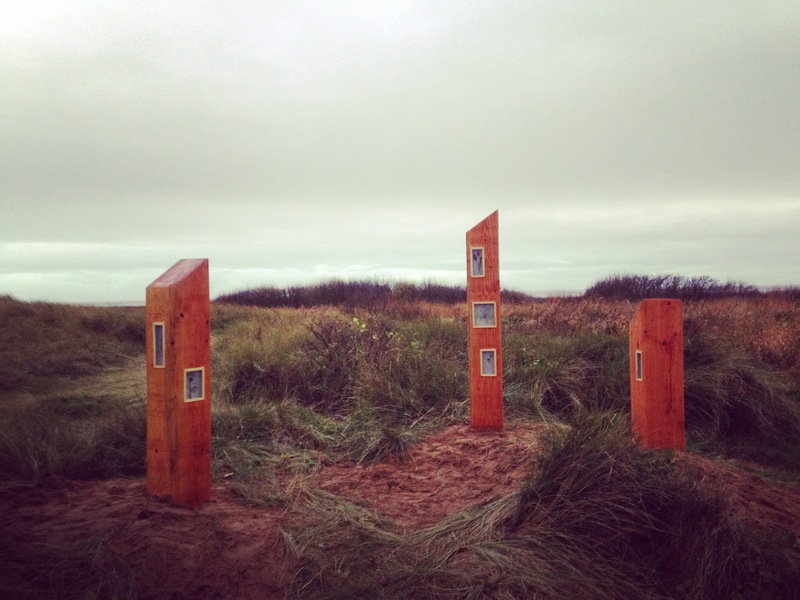 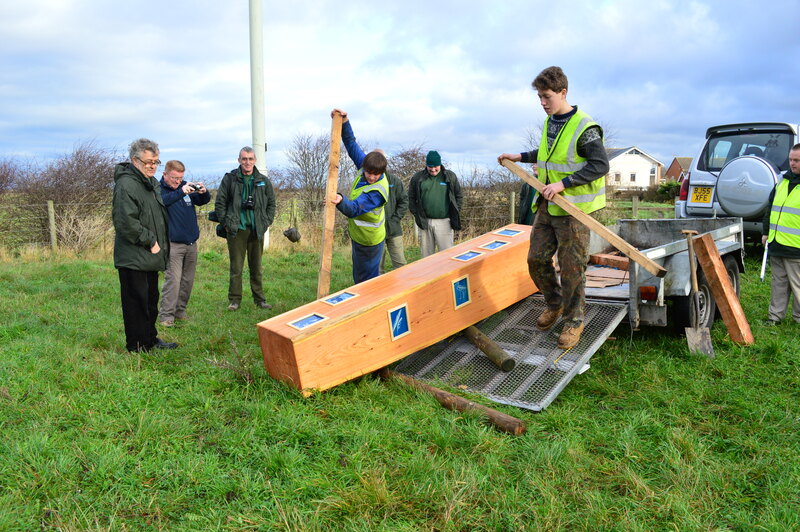 Three Wooden Henges have been installed on the path at Birkdale, near the Weld Road car park. 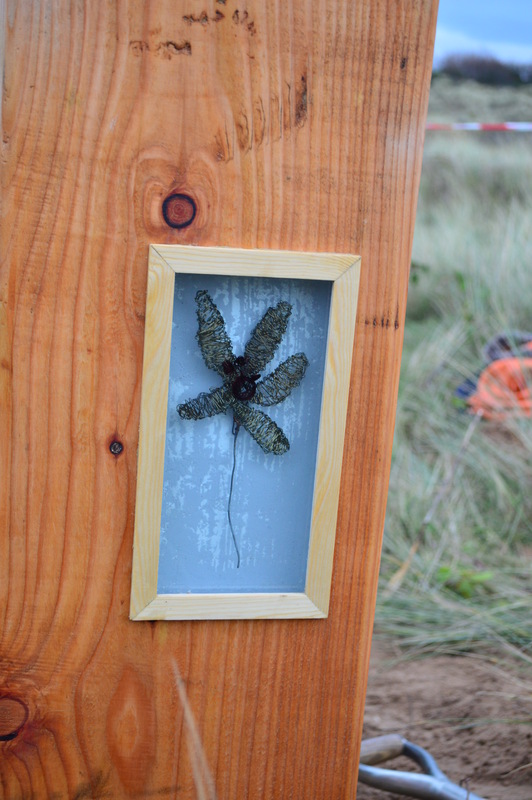 They are in a small patch of wetland – perfectly sited with the artwork representing rare and endangered plant species in the area. 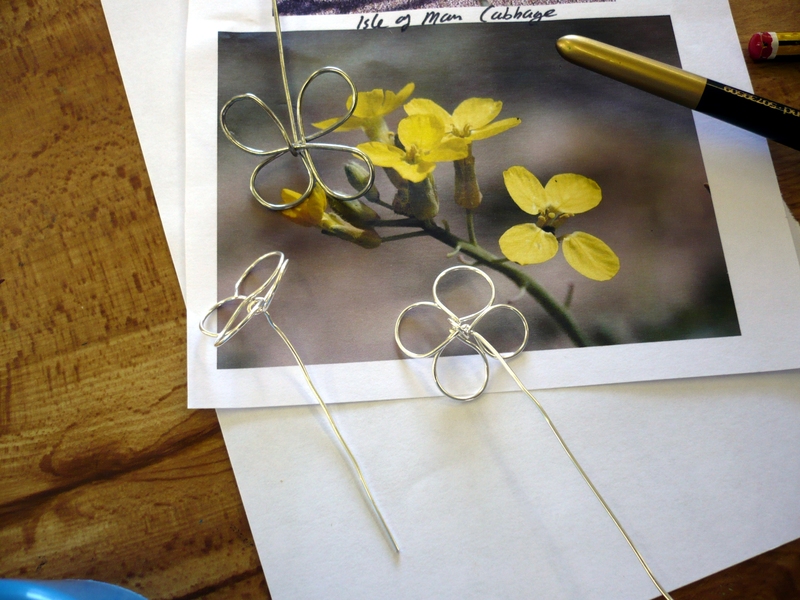 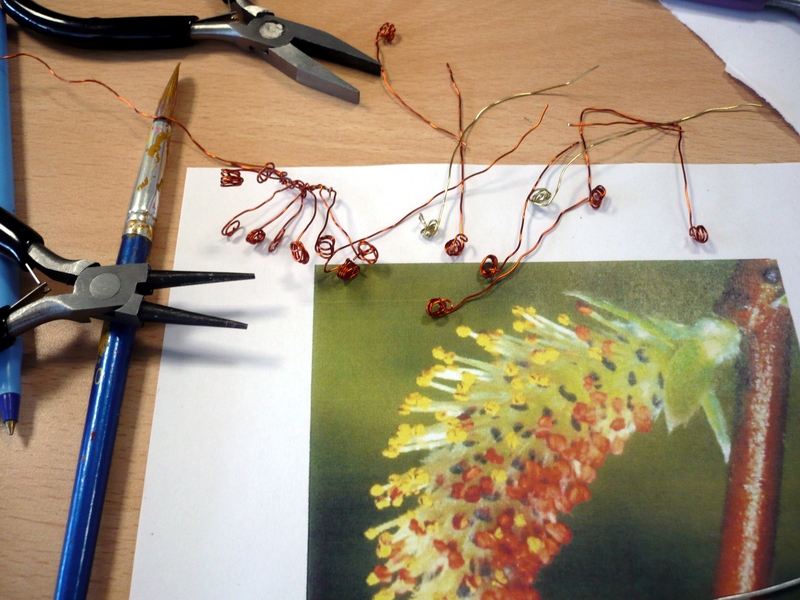 These forms were inspired by the flora of the Birkdale hills and were used to inspire three Go with the Flow groups to make flowers and plant forms out of delicately twisted coloured wire. 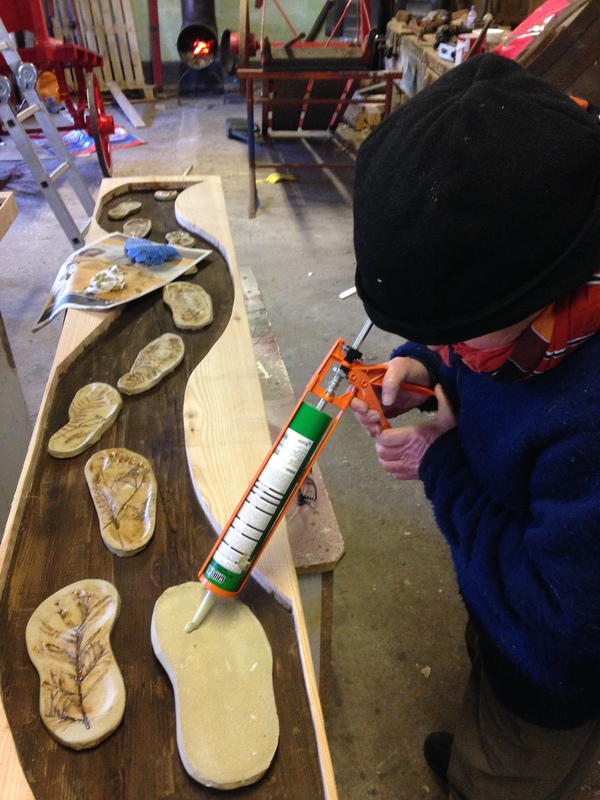 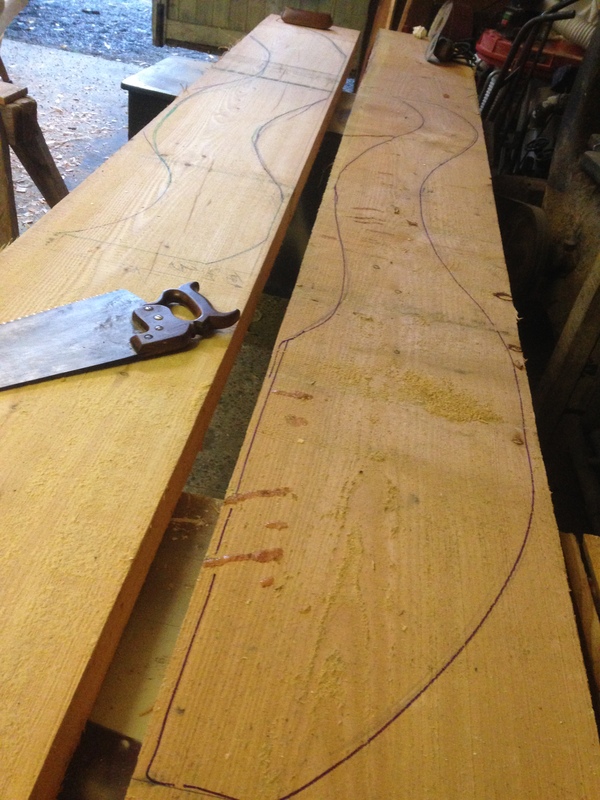 These were then set in resin inside recesses in the wooden henges, each one cut out by hand by Phill. 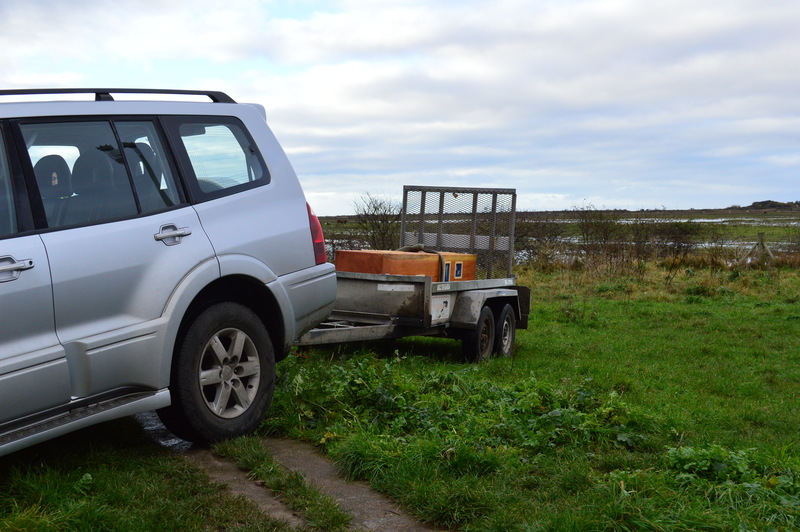 When the three Henges were ready they were loaded onto a trailer, taken on site and unloaded, under Pepper’s watchful eye..
so that digging could start. 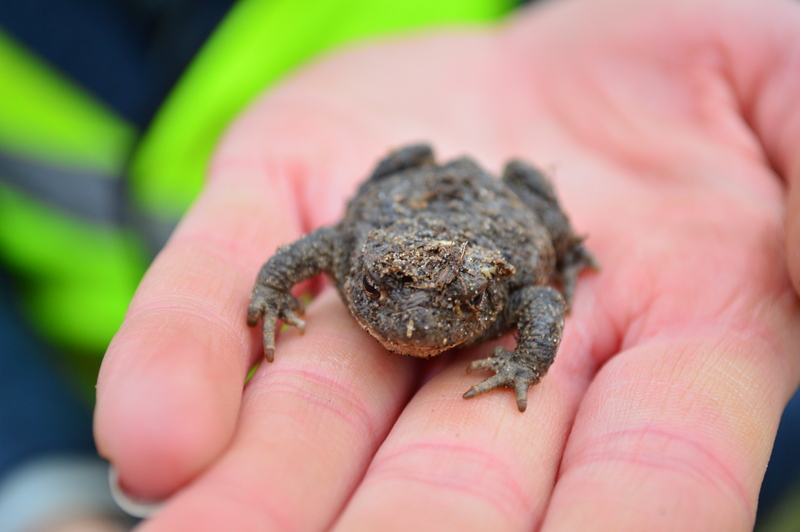 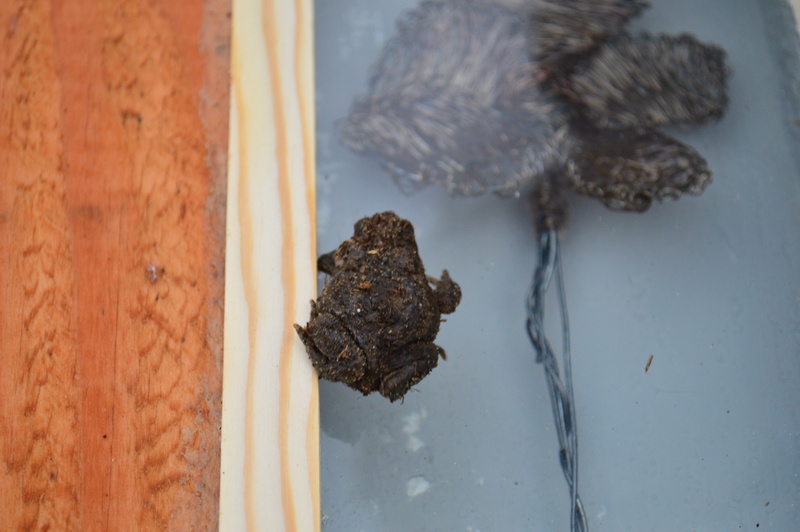 only pausing to rescue a toad deep in one of the holes.. 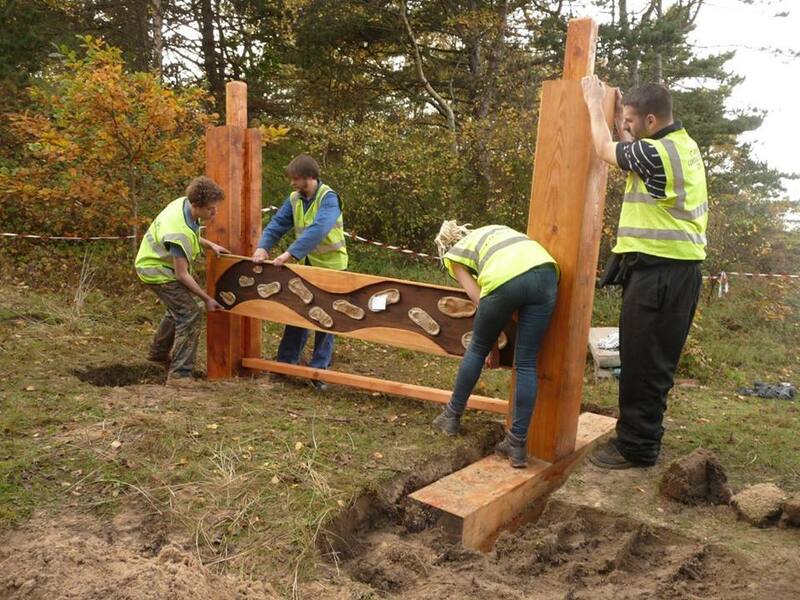 Finally the holes were deep enough to lift each Henge upright and set then in place. 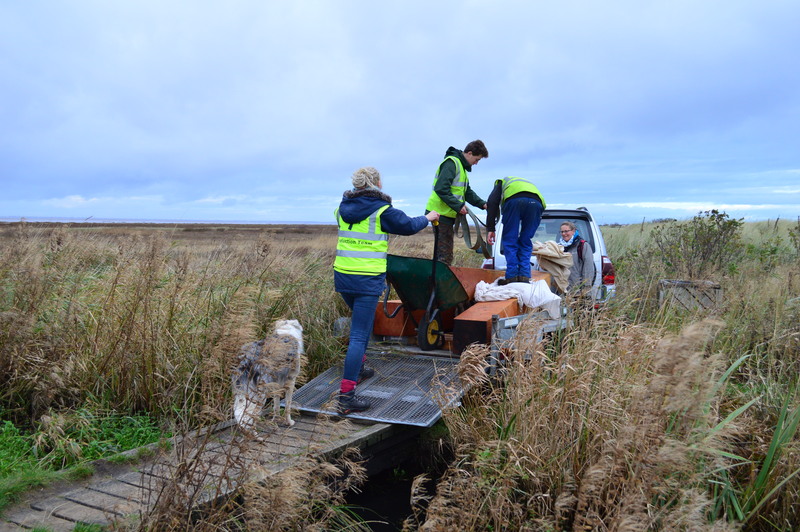 Thank you Go with the Flow Bootle and Southport. 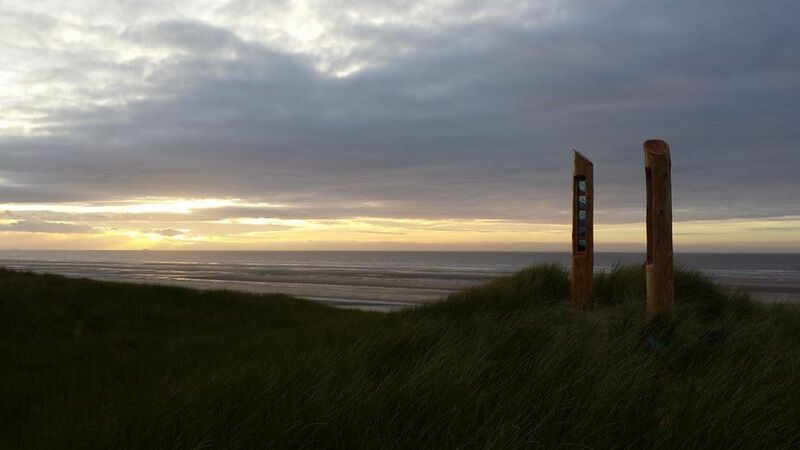 and Free Flow, Formby. 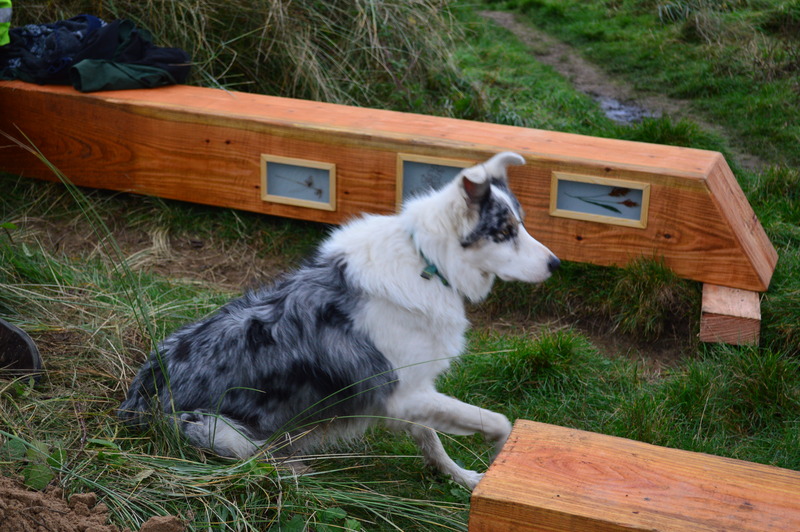 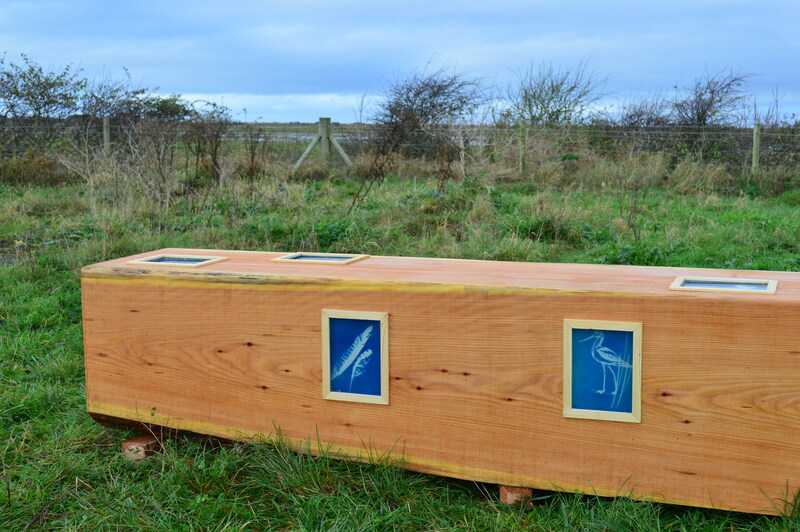 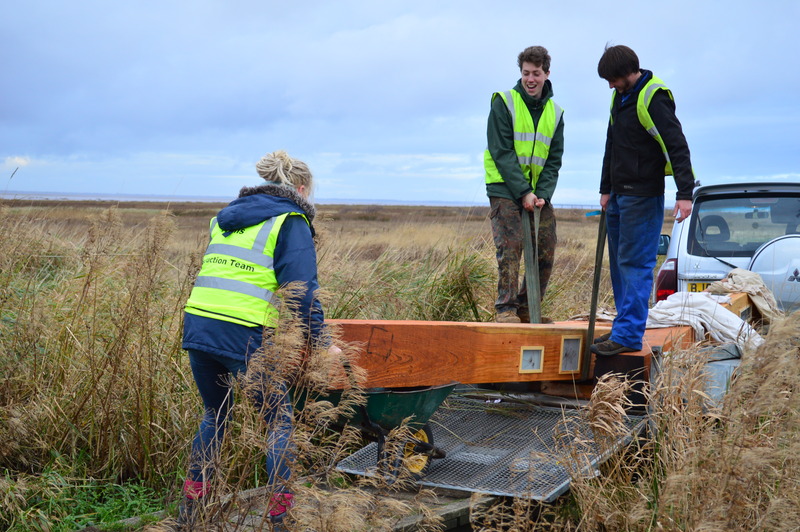 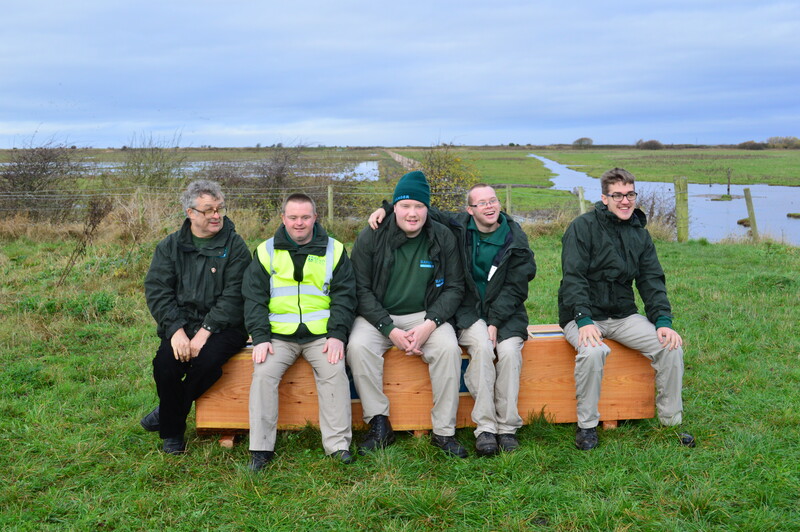 The Bird Bench has been installed on the RSPB Marshside site on a lovely section of the coastal path that overlooks the wetlands. 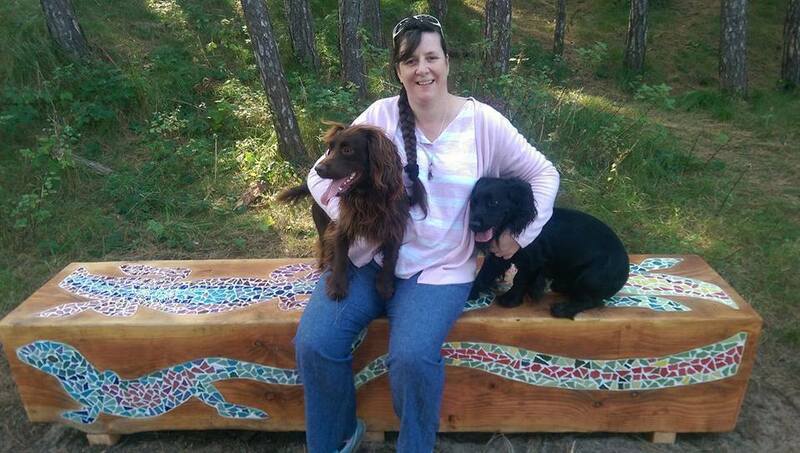 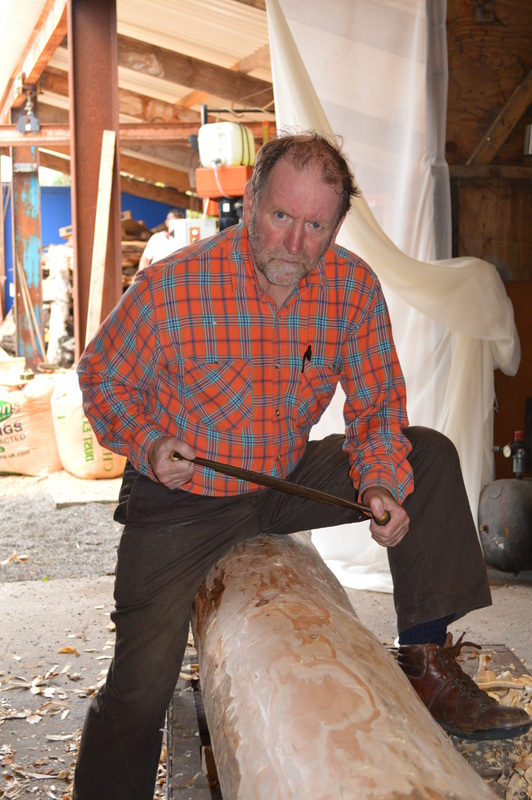 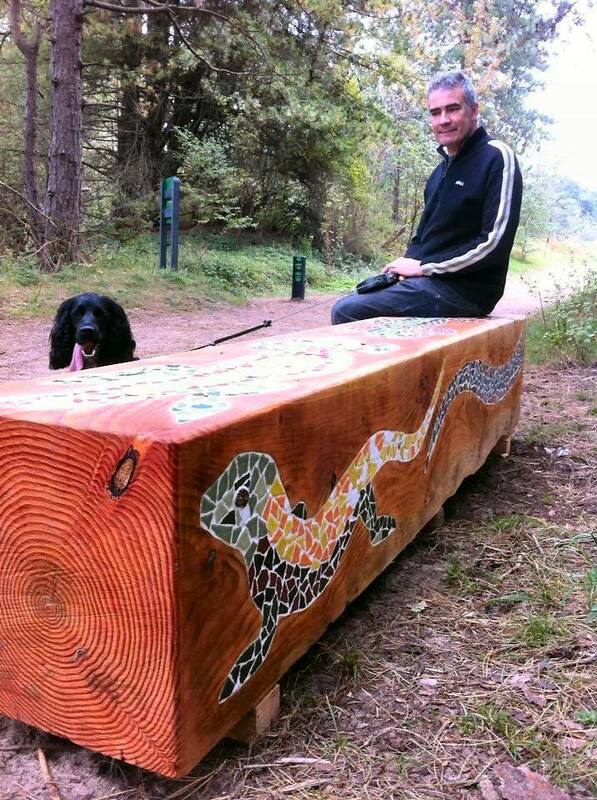 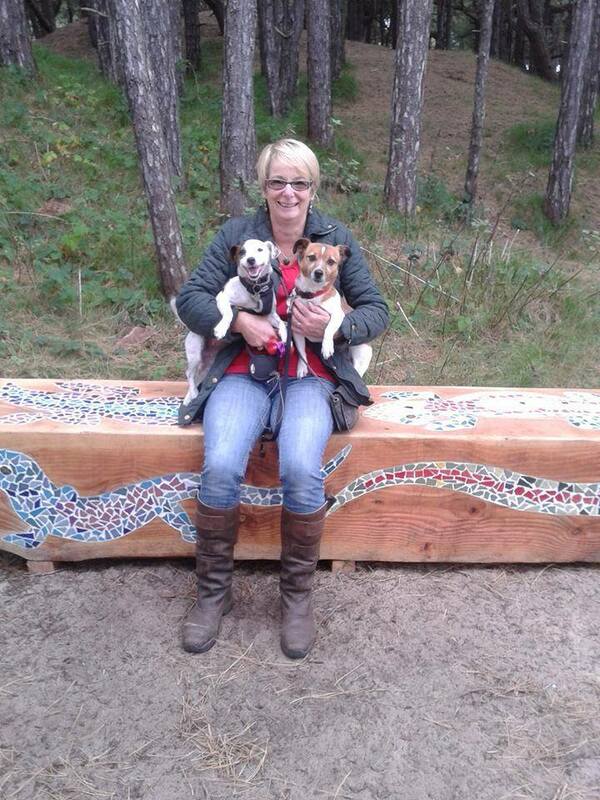 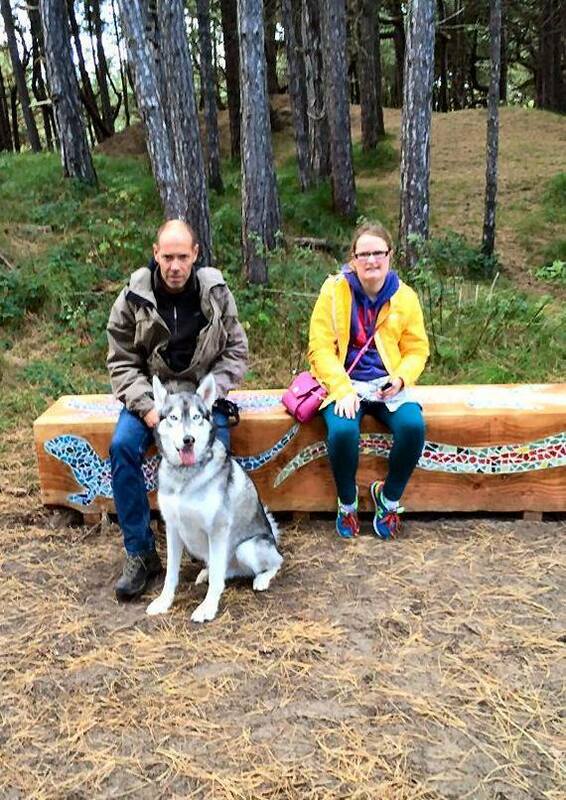 The Bench, hewn from a tree trunk by Phill Gregson, has individual artworks embedded in resin in the wood. 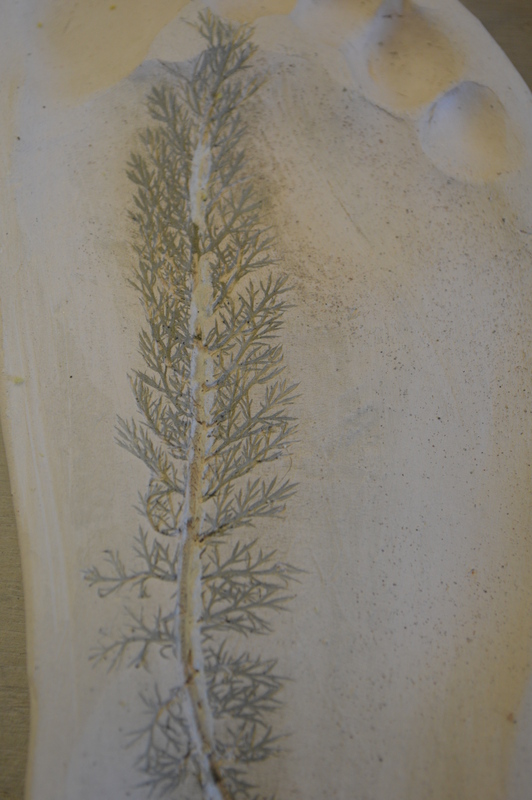 We worked with the Natural Alternatives team based at Ainsdale to create the artwork using the ancient photographic process of Cyanotypes. 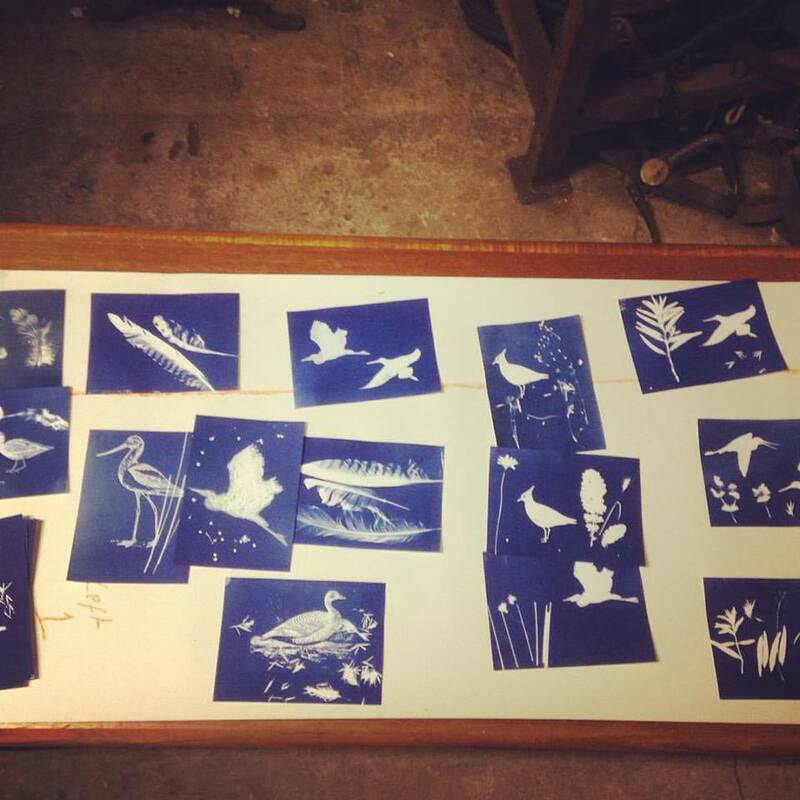 Through this workshop they created the delicate blue and white images of some of the birds that can typically be seen from the Bird Bench location. 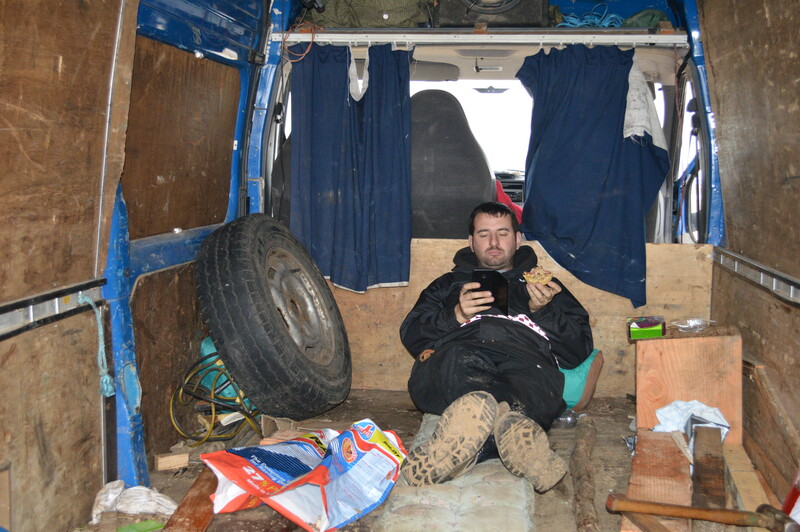 and for the team to test it out for comfort! 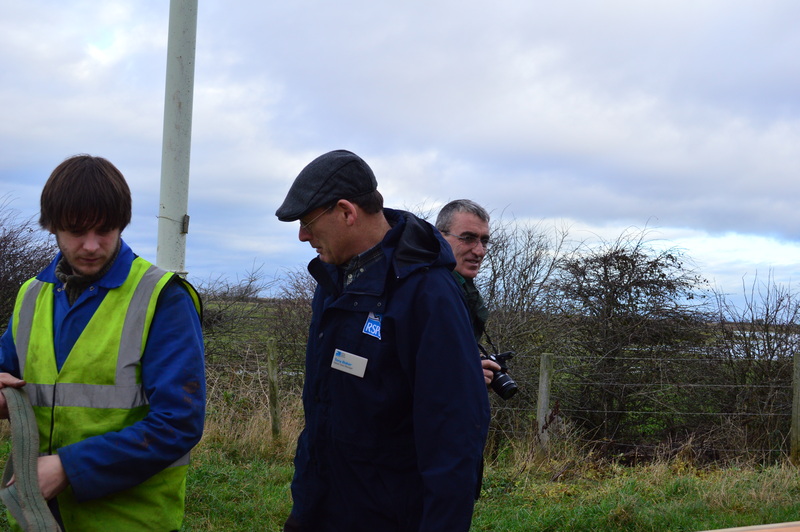 Thanks to Tony Baker and United Utilities for enabling the choice of this site and to all at Natural Alternatives. 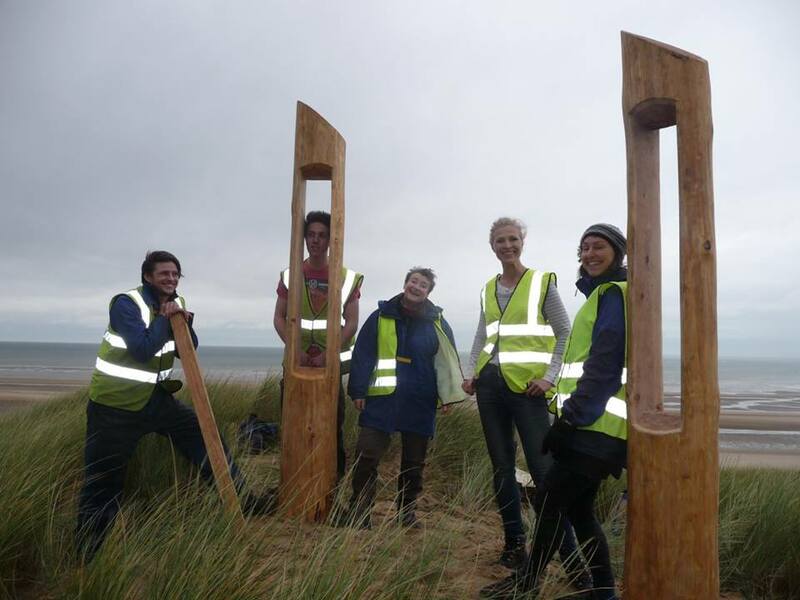 The Poles for the stained glass pieces have been installed and rise like ancient sentinels on the sand dunes at Ainsdale. 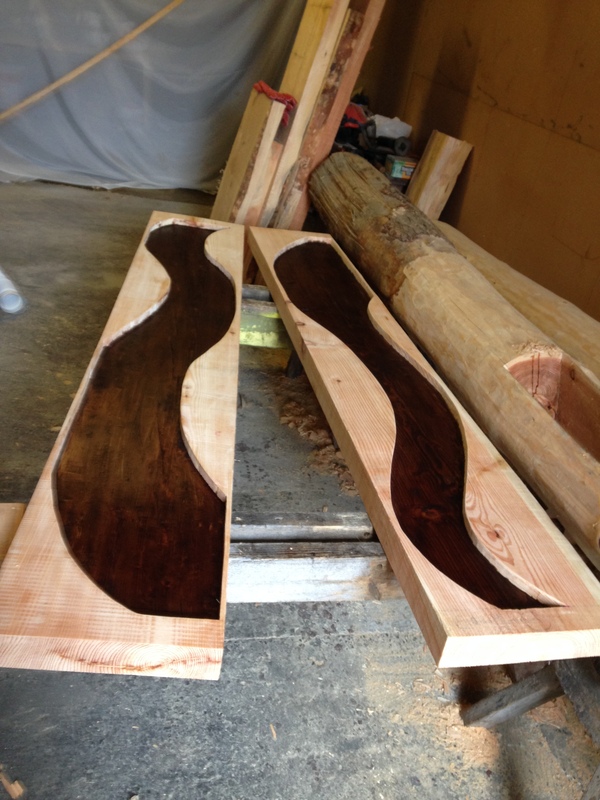 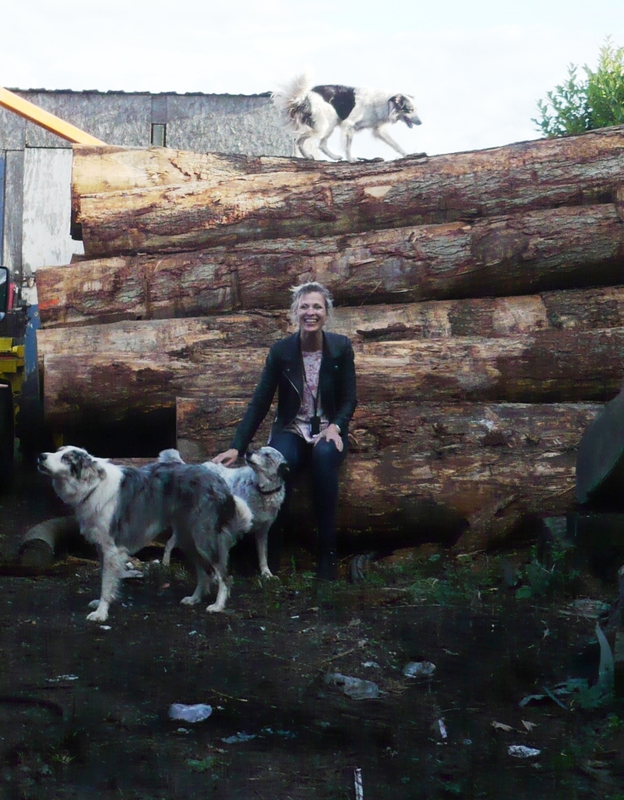 from their arrival as raw tree trunk logs..
and the creation of the window cavities by Phill. 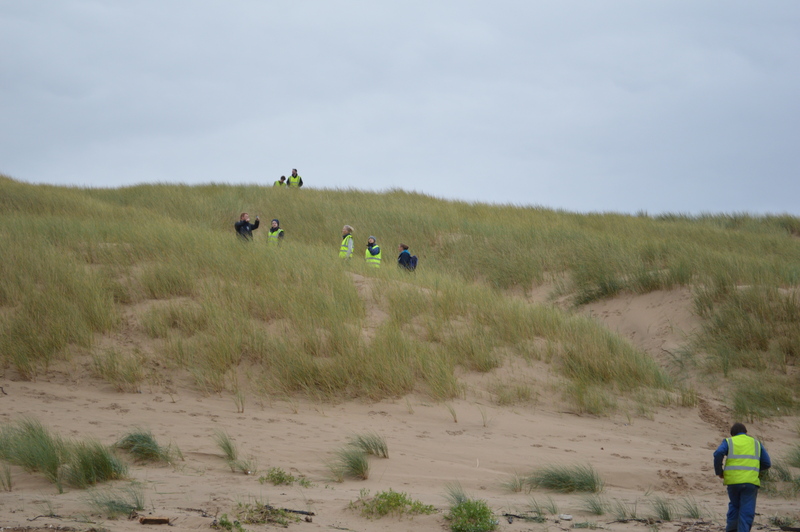 checking the sight-line from the beach. 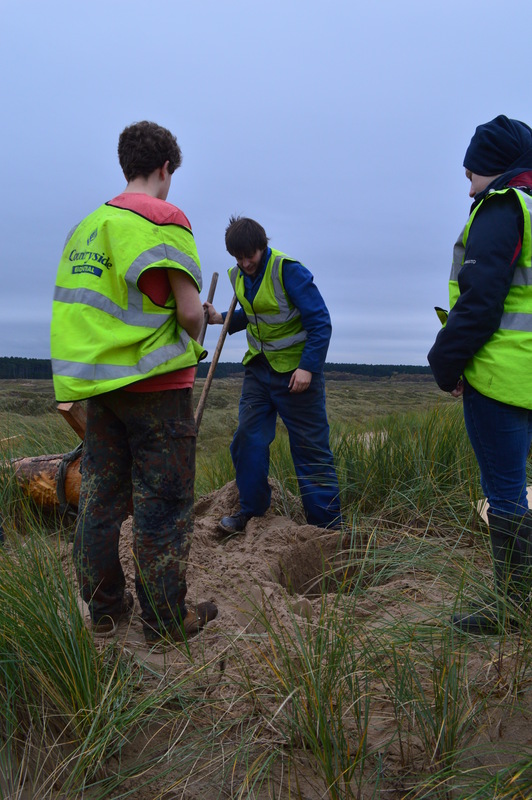 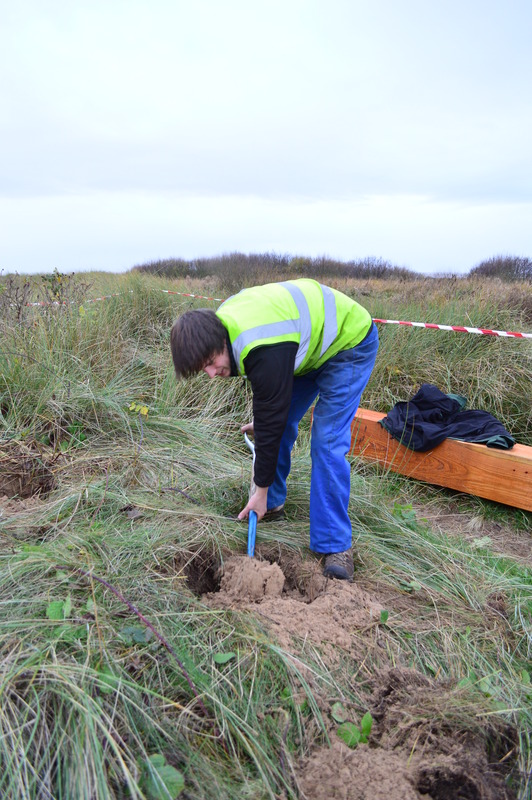 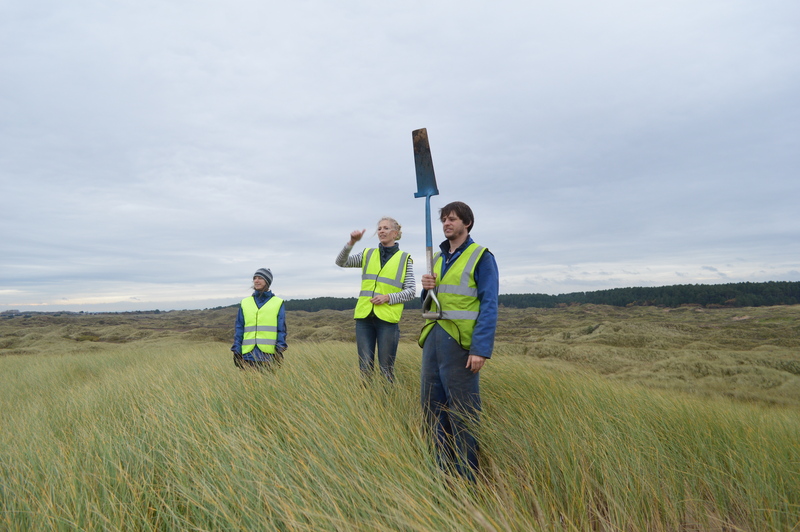 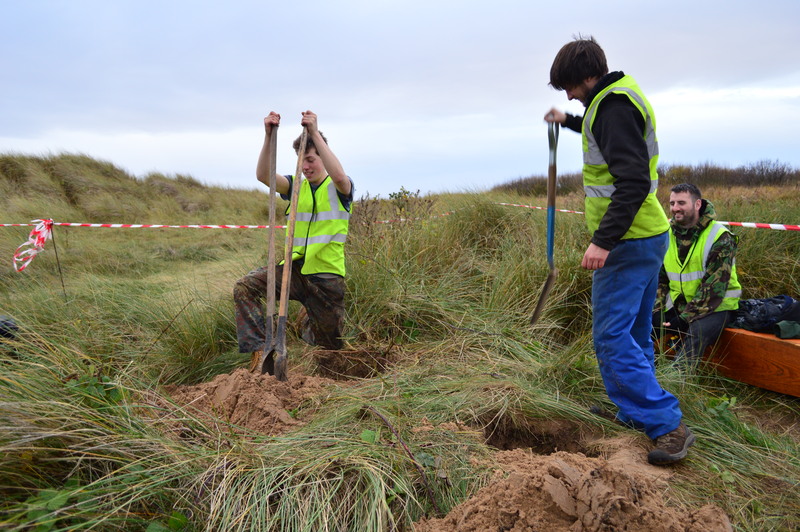 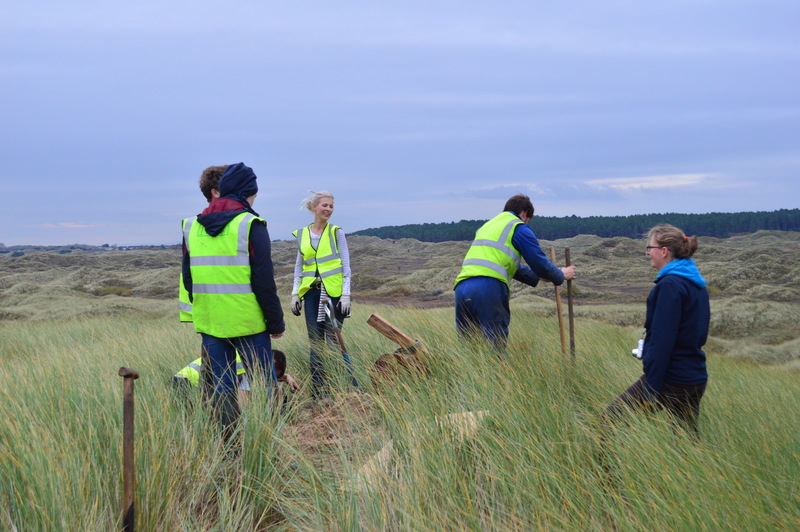 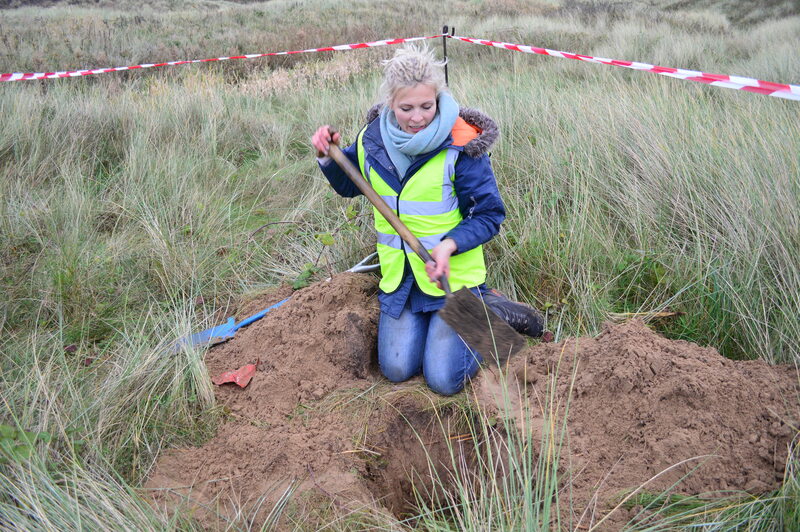 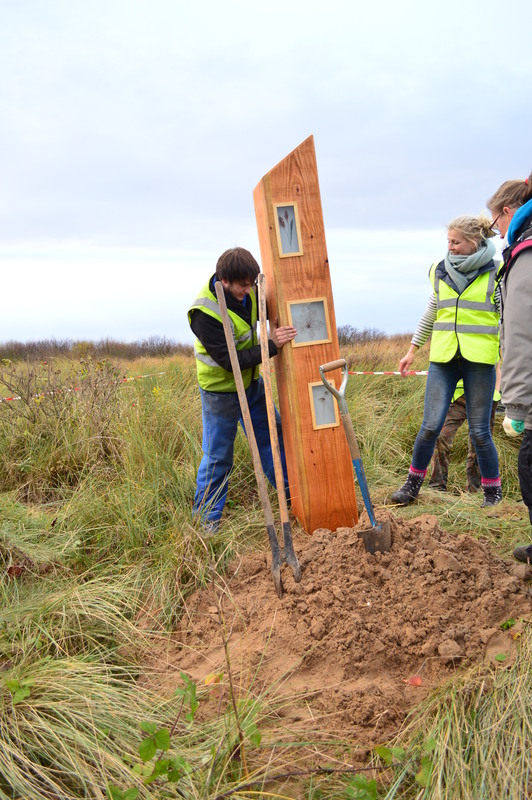 The dunes are fragile, so the posts had to be carried up by hand – taking 8 of us in harness to lift them up the steep slope one step at a time. 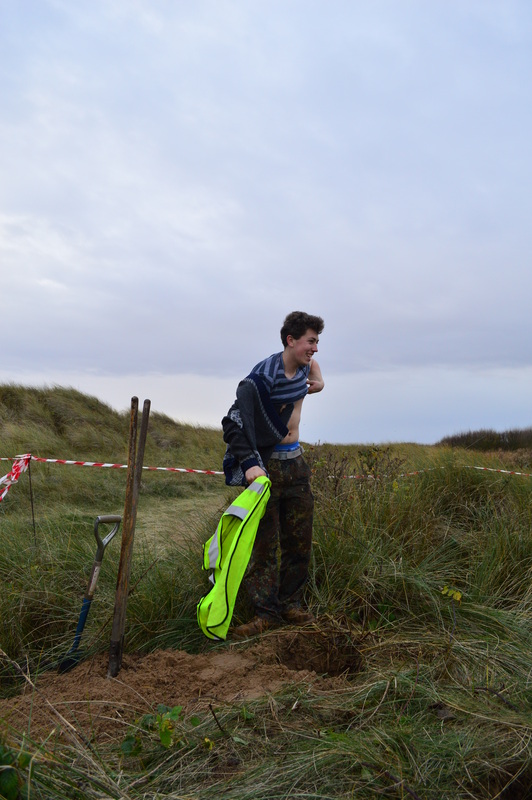 Then the digging could start. 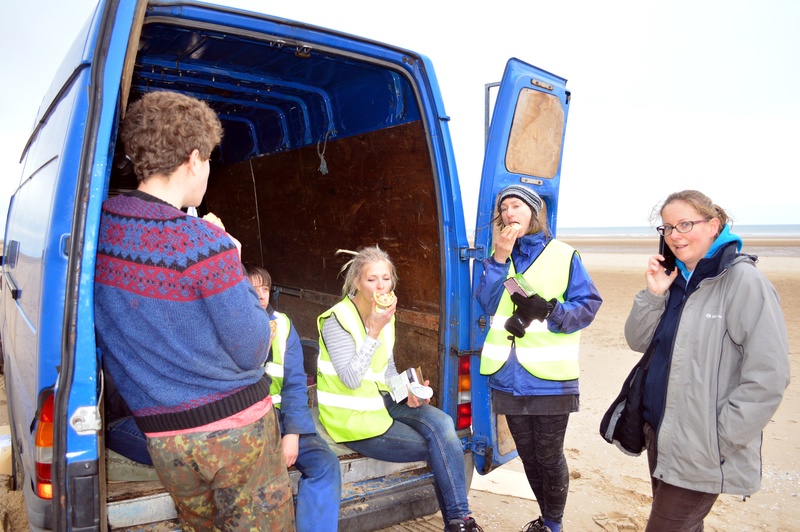 When the holes were deep enough, the poles were guided in and embedded with more sand..
and a well deserved lunch break – pies all round! 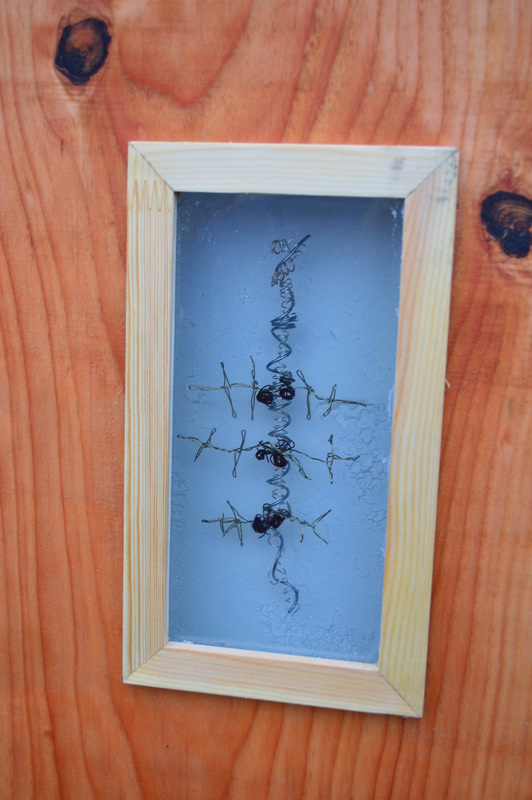 and await the installation of the glass….. 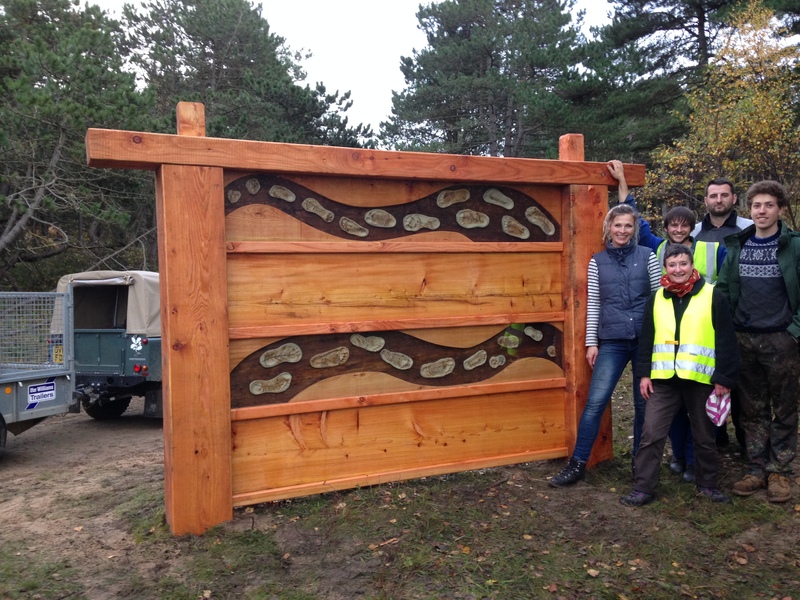 The Clay Footprint Wall is now installed at The National Trust New and Old Plantation Site in Formby. 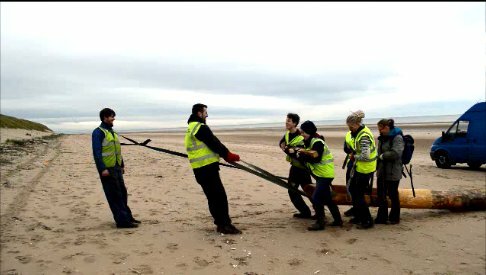 Here is how we did it.. 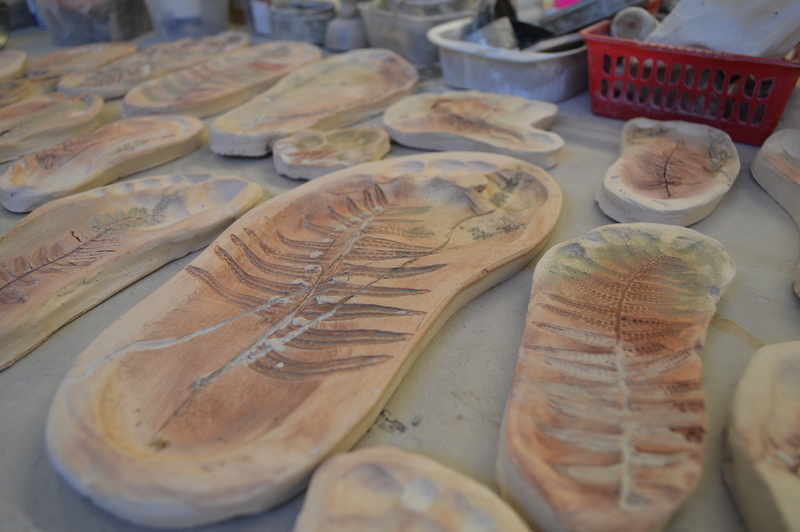 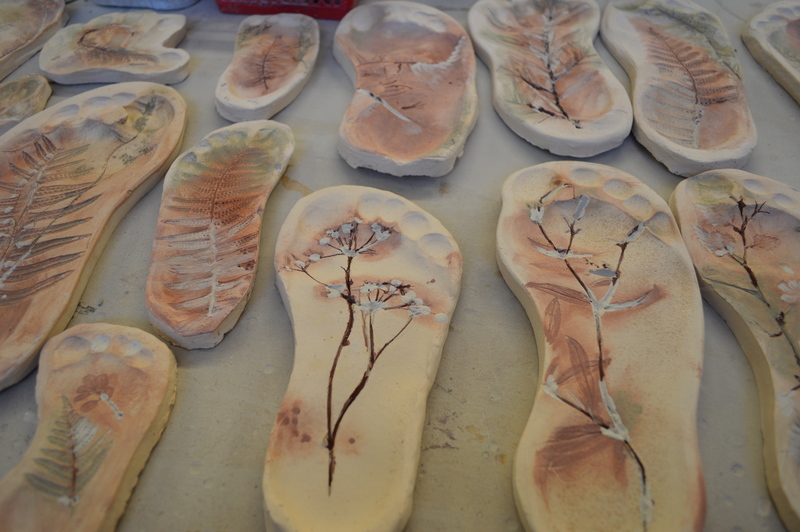 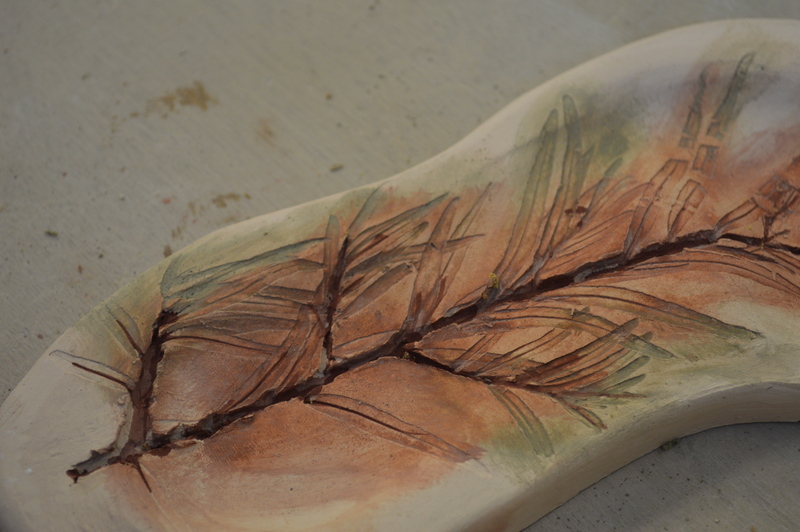 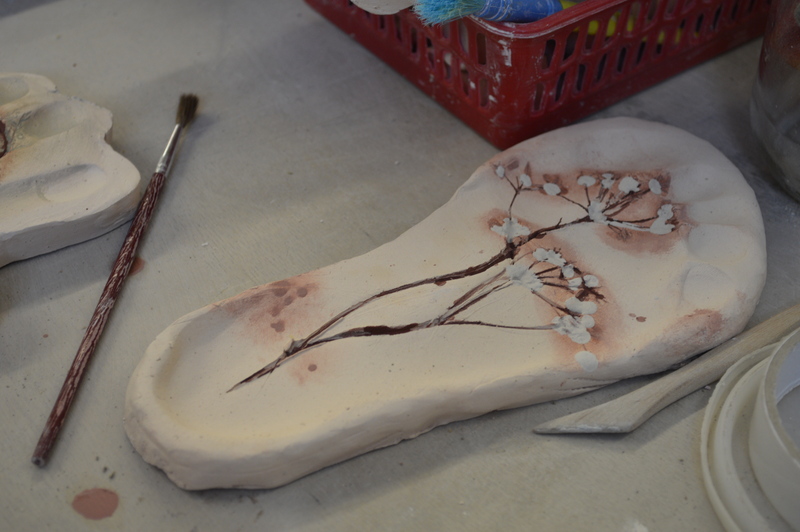 The glazing and firing really brought out the beautiful shapes of the flora impressed in the feet. 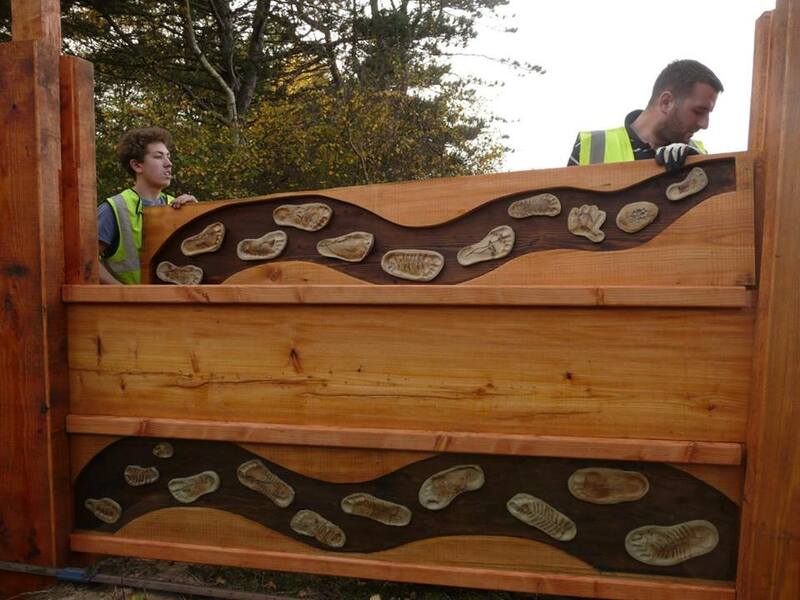 We designed a wave pattern on the wooden panels. 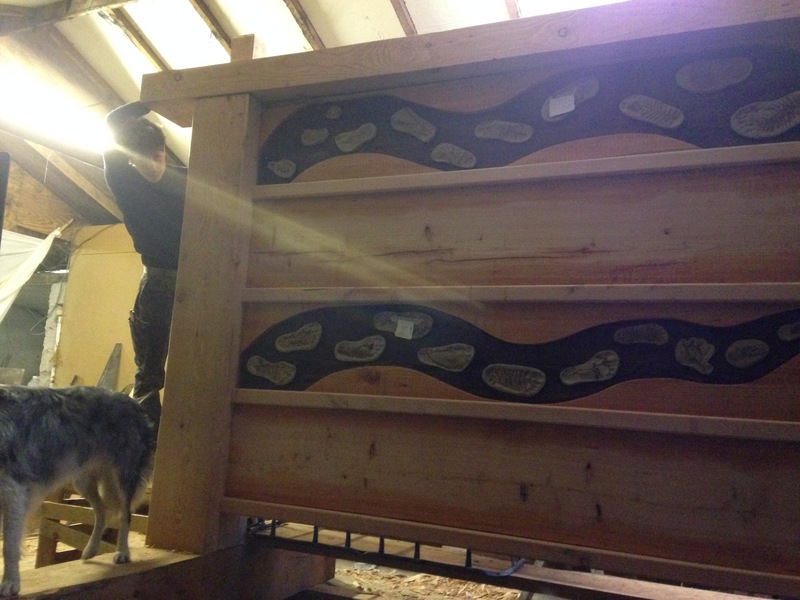 A long days work but the wall is in place. 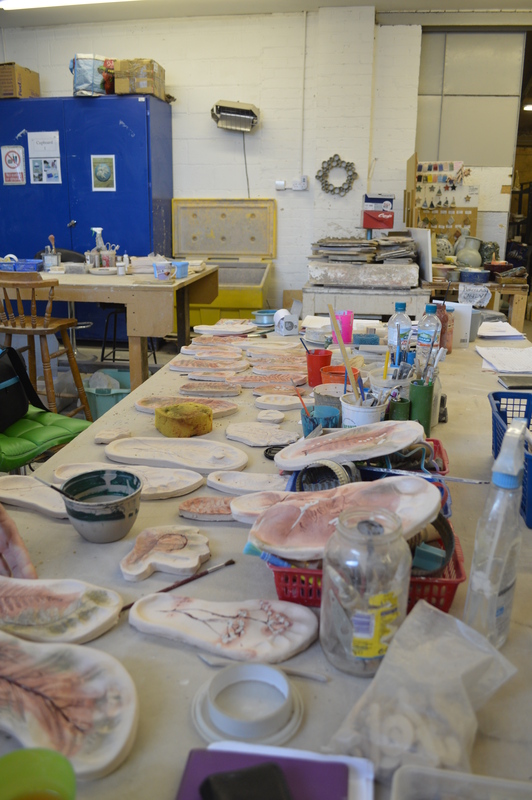 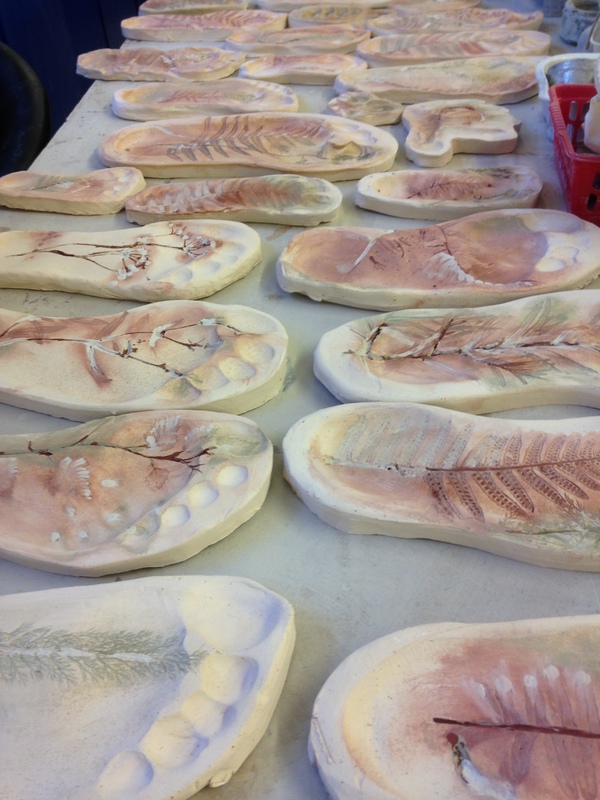 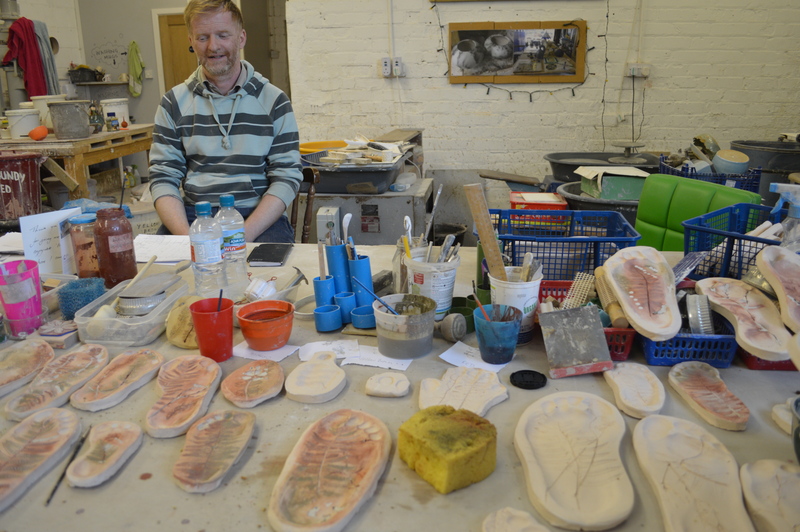 After the bisque firing we went to the Southport Ceramic Studio to see the clay feet. 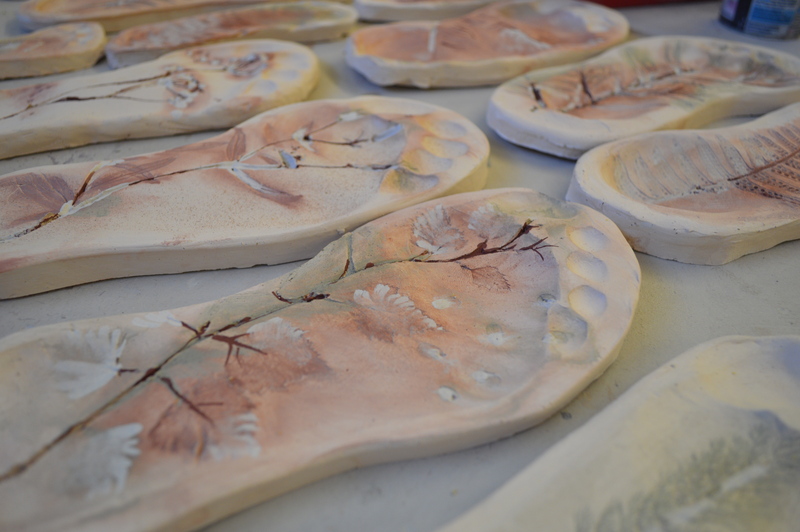 We were really thrilled with the way they turned out, with strong imprints of toes and feet. 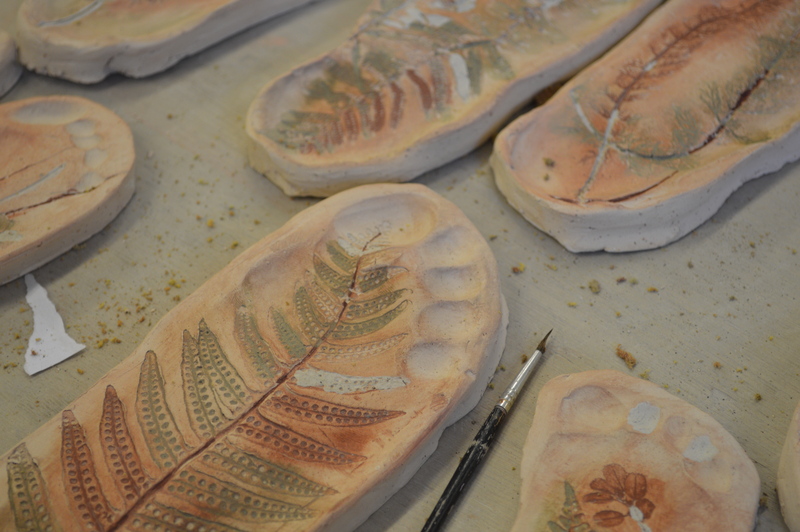 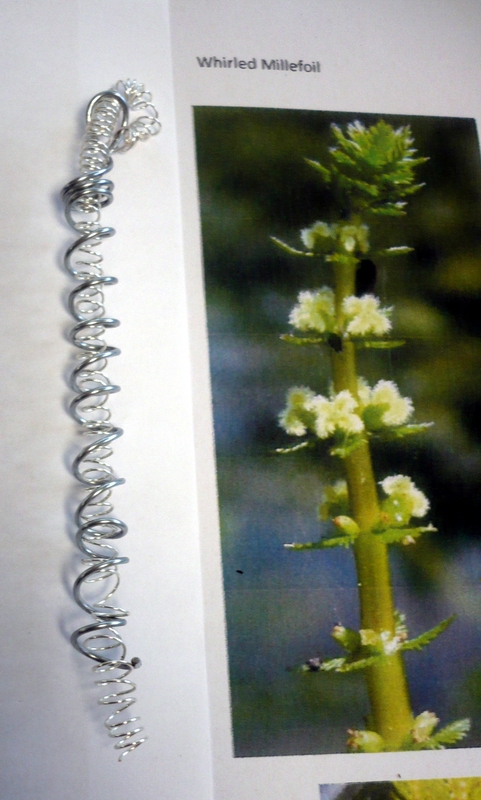 Everyone at the family day workshop had done a great job of rolling on the plants and there is a lovely mixture of both bold and delicate forms. 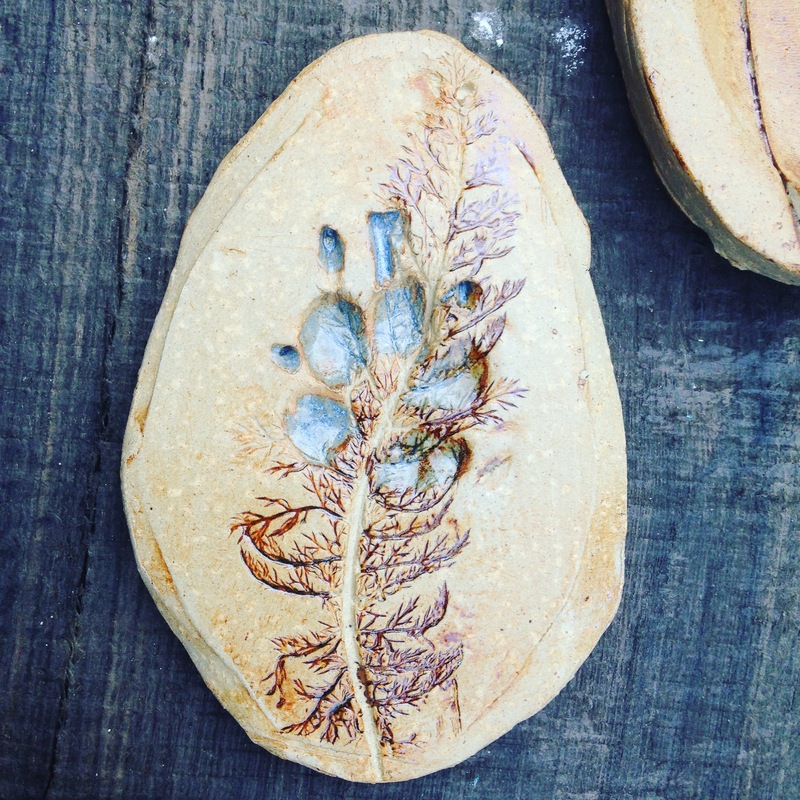 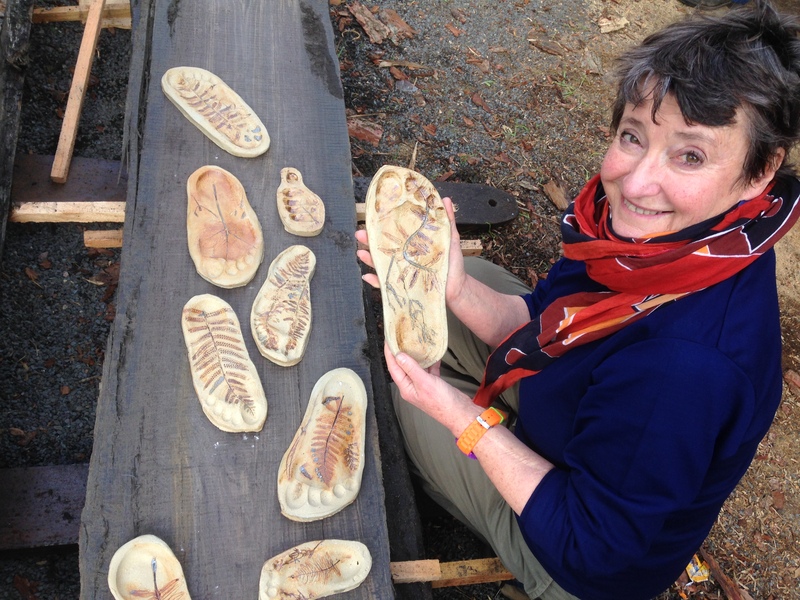 There are over 40 feet – including animal paw prints – that we will be able to choose from for the wall. 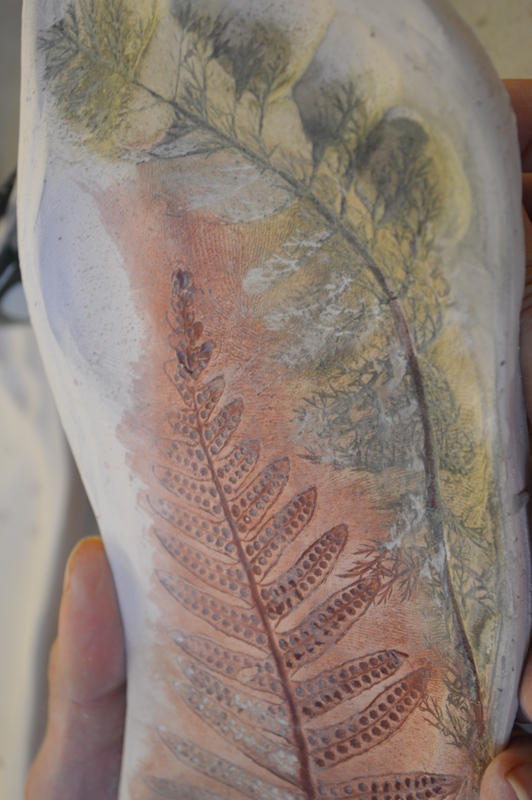 We spent 3 hours painting on glazes and oxides and rubbing them into the delicate plant traceries.